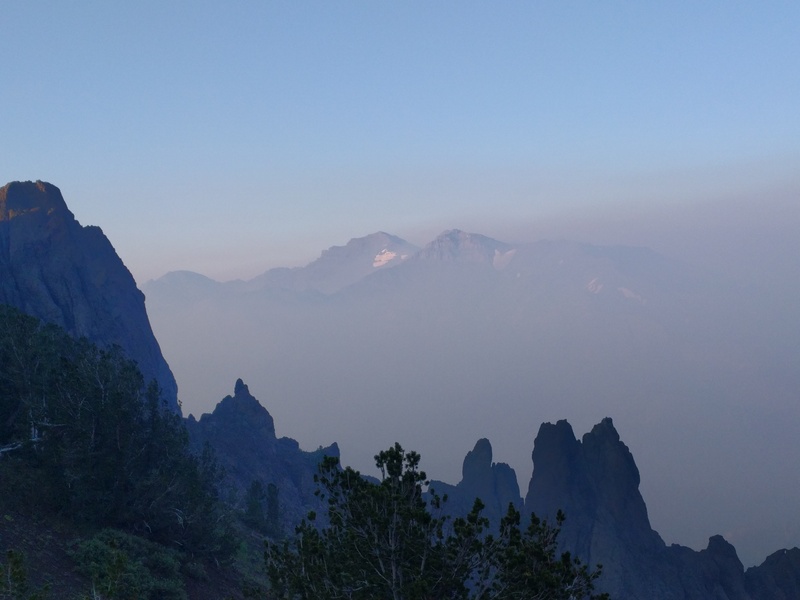 I am recently back from a fairly challenging 15-day summer backpack along a section of the Pacific Crest Trail, one covering 555-kilometers (345-miles) through central and northern California. If you follow HumanaNatura, you may know that extended walks of this kind are a regular occurrence for me, and something I encourage for anyone who is able. What was different this time, however, is that I did the entire walk eating ketogenically, or with a very low carbohydrate intake and primarily burning ketones or fats for energy. Since ketogenic exercise at this level is still unusual, and because there remains quite limited material on ketogenic eating amid strenuous exercise and other demanding physical activity, I wanted to use this opportunity to summarize what I did and experienced. Hopefully, the discussion will be helpful to you and, as importantly, encourage researchers to explore intensive exercise and sustained activity amid intentional ketosis. Before beginning our discussion, let me emphasize that I did this extended keto-enabled walk after a significant time of eating and exercising ketogentically in my regular life (technically, eating phyto-paleo-keto, or a diet that is plant-rich; free of grains, legumes, and processed foods; and then further largely free of fruits and starches – see here and here for examples of my typical once or twice-daily meals). Because of this, I had given my body sufficient time to become keto-adapted or able to readily (and naturally) use fats as my primary energy source. Importantly, regardless of how physically fit you are or may become, I would recommend not engaging in strenuous or extended exercise on a ketogenic diet until you are fully keto-adapted (this normally takes a month or more), reasonably experienced in ketogenic eating overall, and have successfully exercised more moderately on a ketogenic diet for a number of weeks. I would also recommend avoiding alcohol entirely while eating, exercising, and living ketogenically, as is my practice. With different readers and levels of interest in ketogenic exercise in mind, let me divide our discussion into two parts. First, I will briefly discuss ketosis-based exercise of up to a day in duration. Then, I will turn to a more in-depth summary of my multi-day, ketone-enabled walk and exercise expiriment. As you may know, especially if you have been eating and exercising ketogenically for a period of time, we are normally perfectly capable of living and substantially exerting ourselves on a ketogenic diet – as long as we are keto-adapted, healthy generally, and physically conditioned for the exertion. Whether our daily exercise activities involve calisthenics or weightlifting, sprinting or other forms of high-intensity exercise, running or swimming long distances, or day-long walking or cycling, in practice ketogenic eating appears roughly on par with glucose-based nutrition in many or most regards (again, this area is not well-studied and my comments are based primarily on experience, informal observation, and anecdotal data – but see the discussions of exercise at Ketosis). However, during exercise and as in regular life, people who eat ketogenically and are keto-adapted appear to be largely free from both significant feelings of hunger and substantial fluctuations in our physical and mental energy levels. In this regard, strenuous exercise during intentional ketosis is often decidedly unlike glucose-based sports nutrition, where frequent hunger and varying energy levels are common. What may be less well-understood today, even among people who have eaten and exercised ketogenically for an extended time, is that a significant portion of our performance potential during intentionally sustained ketosis does not appear to depend on our eating concurrently with or immediately before activity – at least during exercise and endeavor of up to a day. Often, if we are in ketosis, are keto-adapted and healthy, have adequate body fat, and are sufficiently conditioned for the activity, we can undertake many forms of strenuous exercise and activity without eating, and with little or perhaps even no reduction in our physical and cognitive performance levels. Notably, this decoupling of eating and performance appears to be especially true if we keep ourselves adequately hydrated and also replace lost electrolytes with multi-salt supplements as we exercise and perspire. I will return to these important proposals in our discussion of multi-day exercise. Doubtless, there are exceptions to this rule and examples where ketogenic-based performance suffers from an immediate lack of food. But in many circumstances, as long as the above conditions are met, my experience and observation is that ketogenic athletes often can engage in intense or strenuous exercise for a number of hours without eating, seamlessly drawing on their body fats for energy instead. This important practical aspect of ketosis both reflects and offers crucial insights into the often unintuitive and misunderstood metabolic process that is ketosis. It also underscores the naturalness of ketogenic fasting and functioning in humans and other animals. And it strongly suggests the essential adaptive advantage and natural basis of of ketosis, relative to glucose-dominated nutrition and functioning – enabling vigorous and sustained natural action in the absence of food. My multi-day ketogenic backpack likely provides a familiar pattern or example of physical and mental effort – in terms of both intensity and duration – to others who engage in extended exercise or strenuous activity over a number of consecutive days. Typically, I would rise at about 6 AM, immediately break camp, and walk for at least an hour before eating. I would then eat whenever I felt hungry, which was generally 3-5 times per day, but notably did not snack between meals. Importantly, after a bit of experimentation and adjustment during the first few days of my walk, I would eat the same foods and roughly the same amount and proportions of foods each day, targeting a daily intake of approximately 3000 calories. Of course, I filtered and drank water along the way, in my case upon clear feelings of thirst or during high perspiration, rather than regularly or on a fixed schedule. On this particular walk, I typically consumed about six litres of water per day. Logistically, on this particular walk I was able to reprovision in small towns approximately every 4-5 days. When in town, I would notably take the opportunity not only to purchase the above trail foods, but would also green and fortify my diet (ketogenically) with either a prepared meal or purchased vegetables and other perishables. 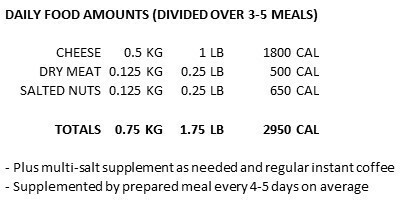 If I did not have this regular opportunity to augment my trail diet, or if my walk was significantly longer than 15 days, I would have taken a daily vitamin and mineral supplement (one that was food-based rather than synthetic), in addition to my electrolyte supplement. As you may have already noted, and consistent with ketogenic eating overall, the above trail diet was extremely fat-rich, and my principal and limited source of carbohydrates was from the various nuts I consumed (providing roughly 20-40 grams of carbs per day). In terms of exercise levels on my trek, I would typically walk at about 4 kilometers (2.5 miles) per hour, slightly less uphill and often a bit faster down, and for 1-2 hours at a time, before taking rest breaks of 5-15 minutes. I also normally would take an extended rest stop of about 2 hours each afternoon. Most days, I would walk until at least 6 PM, though on some of my longer-distance days I walked until 8 or even 9 PM. Temperatures ranged from about 10C (50F) at night to 30C (85F) in the afternoon, and I did have times of substantial perspiration – notably when steep or sustained ascents were required in afternoons. In this temperature range, however, I had no problem with spoilage and my trail foods would remain reasonably cool in my pack and bear canister throughout the day. Since I averaged 37 kilometers (23 miles) per day over the (uninterrupted) 15 days, this translates into approximately 9 hours of walking each day – though I walked considerably more than this toward the end of my walk, as my conditioning and acclimatization improved. On this last point, and for context, I should describe the terrain of my walk. Along the mountainous section of the Pacific Crest Trail that I covered, altitudes typically ranged from 1800 to 3000 meters (6000 to 10,000 feet) above sea level, and my cumulative daily elevation gain generally was between 1200 to 2400 meters (4000 to 8000 feet). In addition, my lightweight backpack and gear, including food and water, usually weighed between 7 and 10 kilograms (15 and 22 pounds). For all these reasons, the walk, while a walk, was physically and mentally demanding, and I think a good natural experiment and study in ketogenic eating amid strenuous and sustained exercise. Before discussing my multi-day performance results along the trail, let me touch on four qualifying points that may be important or of interest to you. First, I began the walk physically quite lean already from my daily ketogenic eating, with body fat in the 8 percent range, and did not wish to (and did not) realize significant weight or body fat loss along the trail. This was the principal reason for my fairly generous 3000-calorie daily dietary target. If you are not as lean as me and wish to achieve weight or body fat loss from a multi-day trek or similar endeavor – and are keto-adapted, healthy, and adequately fit as described above – you likely could consume fewer calories, again without experiencing a significant hunger or loss of energy, and achieve such body weight and fat reductions (as with daily ketogenic exercise, as long as you stay adequately hydrated and use a multi-salt supplement to replace lost electrolytes). Second, and related to this point, while I did not wish to lose weight or body fat on my walk, and thus ate vigorously for the 15 days, I have little doubt that I could have completed all or much of the walk at similar performance levels without eating, or amid a ketogenic fast (as discussed above, given that I am keto-adapted, healthy, and fit – and as long as I ensured adequate hydration, salt intake, and also rest). Importantly, even if you are keto-adapted and fit, I do not recommend fasting during a multi-day period of strenuous exercise, since there are natural risks of metabolic exhaustion. But I make the point to again underscore a crucial and generally overlooked aspect of our human physiology – that we are naturally and generally capable of sustained vigorous activity in the absence of food for significant periods of time (though of course not indefinitely). Instructively, on my walk I ate all my remaining food on two occasions, before reaching towns to provision, and was able to walk for several hours unaffected in both cases. Third, importantly for me and my weight-maintenance goals, and unlike previous multi-day backpacks I had done on a carbohydrate-rich diet, I experienced no altitude or exertion-related loss of appetite or noticeable changes in the taste of food (even as I had no urgent feelings of hunger). This was a fairly dramatic and extremely welcome change for me. Overall, I enjoyed the food I had on-hand, and did not have to force-feed myself along the trail, as I have done during past extended walks. Fourth, and what may be a more narrow area of interest, I did want to mention my exploration of the potential for keto-adapted and food-carrying athletes to consume a significant amount of oils as a staple food. The technical appeal here is the extremely high energy/weight efficiency of carrying oils in place of whole foods (with many oils, which are nearly 100 percent fat, containing upwards of 9,000 calories per kilogram (4500 calories per pound). In my case, I attempted using olive oil in lieu of nuts at the start of my trip. Overall, while my body tolerated and performed well with this amount of oil in my diet, I found the palatability of the oil to be quite poor, and increasingly so with each meal, and curtailed the practice after a few days. Off the trail, I have notably tested coconut oil and clarified butter (ghee) as staple foods, and found each to be similarly unpalatable at appreciable volumes. But perhaps you will have a better experience than I did using oils as a staple food. After my first town provision and prepared meal, I immediately noticed a significant gain in my energy levels and exercise performance for several hours. This led me to suspect that the ketogenic trail foods I was carrying were less adequate or empowering than I had hoped. Intuitively, and over the course of a couple of days, I estimated that my performance was about 80 percent of my post-town levels immediately after eating my trail foods, and roughly 60 percent of my post-town levels when I had not eaten for several hours. However, I soon realized that I could bring my energy levels and performance to roughly 100 percent of post-town levels simply by taking additional salts – either in the form of a serving of salty dried meat or by using my multi-salt electrolyte supplement. I hypothesized, and then confirmed in practice, that the post-town lift I was getting was substantially or wholly due to an increased intake of salts. For the remainder of the trip, I was able to maintain my performance at (personally) high levels via more careful salt or electrolyte management – leading to my overall emphasis that immediate food intake and exercise performance may be only somewhat correlated or even uncorrelated for many keto-adapted athletes and forms of exercise. And how was my performance? The distance statistics I provided above are consistent with earlier and similar mountain walks I have completed, when on a carbohydrate-rich diet. But these figures miss two important points that I will use to conclude our discussion. One is that, owing to an especially busy schedule this spring, I did not have an opportunity to do my normal pre-trek training this time out (though I do hike and exercise daily). Instead, I deliberately eased into the walk and up-trained on the trail, measures which are atypical for me. This no doubt hampered my early performance, but it did have the advantage of keeping me from over-stressing my body and especially feet early on – and thus may have contributed to an easier walk overall. My second concluding point is that the statistics above do not convey how much easier this walk was for me, compared with similar treks in the past. I have already mentioned that I maintained a robust appetite and did not lose my affinity for the foods I had on hand. In addition, I would add that I enjoyed greater physical and mental composure than in the past as well, notably with less energy cycling, or performance highs and lows, on both fronts. Throughout this extended time of strenuous and sustained keto-fueled exercise, I found myself consistently calm, energetic, purposeful, thoughtful, and happy – just as with ketogenic eating and living off the trail. Mark Lundegren is the founder of HumanaNatura. This entry was posted on August 10, 2018, 01:00 and is filed under Natural Eating, Natural Exercise. You can follow any responses to this entry through RSS 2.0. You can leave a response, or trackback from your own site.